This fall, try this for your breakfast sausage. Instead of the traditional breakfast sandwich, you could put these patties between two slices of apples. Or serve one of the patties with a side salad for lunch. They could be made smaller and served as an appetizer on a skewer. 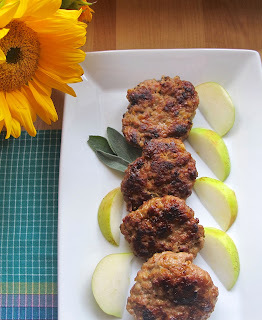 Combine apple, sausage, and sage together in a bowl and mix well; form into 4 patties. Over medium heat, pour oil into a skillet, add patties and cook, turning, until cooked throughout. This is a spicy pesto sauce for you cilantro lovers. Additional varieties of peppers may be added to increase the heat. Today I used it over a sweet potato pasta, but would be great in a sandwich as a spread or alongside some tortilla chips. 1 1/2 cups roasted pepitas, if using raw, toast them in a small skillet, about 3 minutes. In a food processor, combine pepitas, pepper, shallot, garlic, salt and fresh pepper, lime juice and honey. With the food processor running, slowly add the olive oil until well combined. 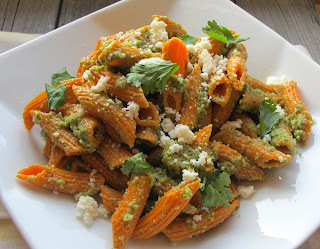 Cook sweet potato pasta, top with pesto and toss. Serve and top with a few cilantro leaves and Cotija cheese. Roasting the sweet potatoes brings out their sweetness and the paprika adds a smokiness. Substituting vegetable stock instead of chicken stock would make this a vegetarian/vegan soup. On a baking sheet, lined with foil, toss the sweet potatoes, and onion with olive oil. Sprinkle with Alfies seasoning and paprika. Roast for about 40 minutes, until vegetables are tender. In a medium sauce pan, add the cooked vegetables, stock, garlic, salt and pepper and cook until heated throughout, check seasoning. Add the lime juice and coconut cream. Blend with immersion blender or Vita mix, until processed. Ripe, sweet Italian prune plums were used for this crumble. If your plums are not as sweet, more sugar may be required. Mix flour, oats, sugar, flax seeds, cinnamon, and salt together in a medium bowl. Cut butter into mixture until it resembles coarse corn meal. 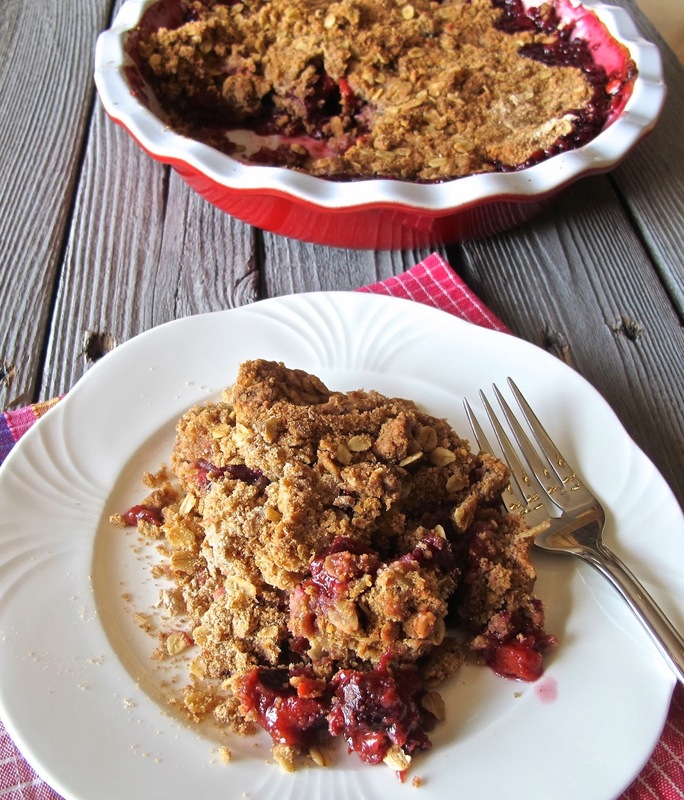 Place plums into a 9 inch pie dish and toss with orange juice. 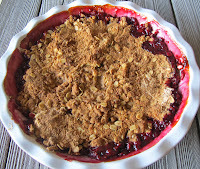 Sprinkle oat mixture over top of plums. Bake until bubbly and topping browns, about 1 hour. Note: This can be served topped with yogurt, whipped cream, ice cream or creme fraiche. I made this vegan because Steph is visiting today. I replaced the butter with olive oil and the heavy cream was replaced with coconut cream. It is delicious either way. In a large saucepan, heat butter over medium-high heat. Add ginger, carrots, celery, and onion, and saute until vegetables begin to soften, stirring frequently, about 5 minutes. Add pumpkin and stir well. Add vegetable stock and bring to a boil. Add salt, pepper, cinnamon, cayenne and nutmeg. Reduce heat and simmer, until vegetables are soft, about 20 minutes. Transfer to a blender or use an immersion blender and puree until mixture is smooth. Check seasoning. Place soup back into saucepan and add the cream. Keep warm. 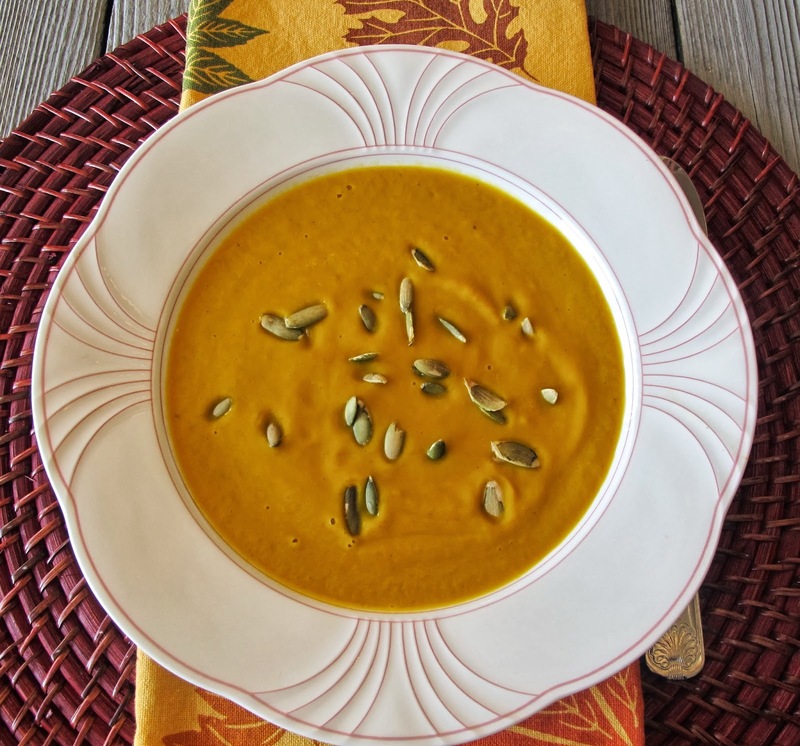 To serve, ladle the warm soup into serving bowls and garnish with the toasted pepitas sprinkled over the top. The combined flavors of this dish reminds Bake of some of his favorite Asian dishes during his travels. For him, it starts with the noodles, total comfort food. Chili oil would be a great addition for a little heat. Bring a large pot of salted water to a boil. Cook noodles according to package directions. Drain and rinse well under cold water, set aside. Combine soy sauce, vinegar, rice bran oil, sesame oil, peanut butter, garlic, ginger and sugar in a blender and blend until mixture is smooth. In a large bowl, combine chicken with noodles, bell peppers, peanuts, green onions, cilantro and sesame seeds. 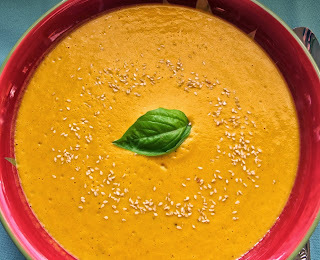 Toss with salad dressing. Adjust seasoning as needed. 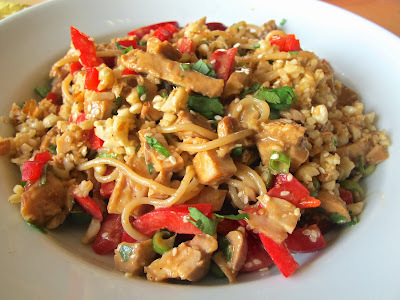 Note: This can be made gluten free by looking for rice noodle or pure soba noodles made with buckwheat and a gluten free Tamari or soy sauce. 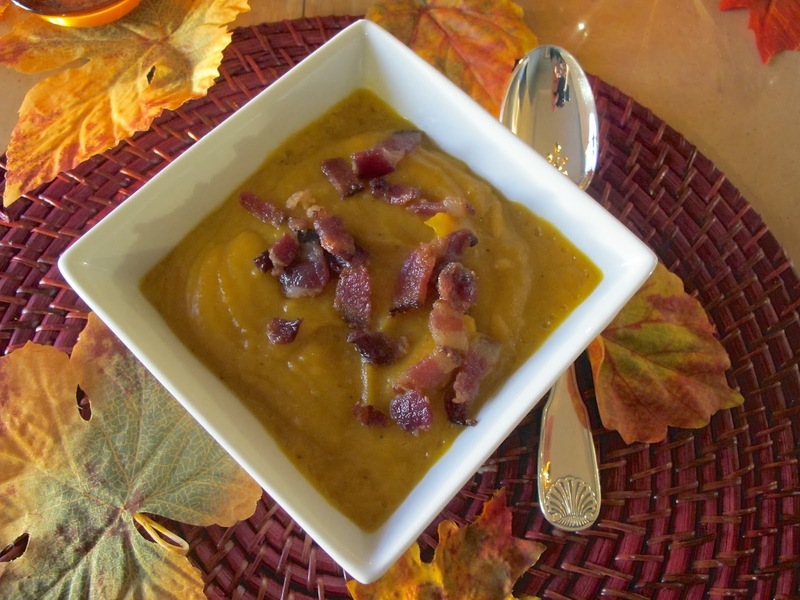 Fresh tart apples with Butternut squash and smoky bacon make this a hearty fall soup. In a large saucepan (dutch oven), cook bacon and remove with a slotted spoon and drain on a plate lined with paper towel. On a sheet pan, place squash and onion and mix with a tablespoon of bacon fat. Season with Alfies and roast in oven about 20 minutes until squash is tender. Into saucepan, with remaining bacon fat, add apples and sage and saute a couple of minutes. Add squash, onions, chicken stock, maple syrup, and nutmeg until heated throughout. Thin with apple juice, if desired. Puree in batches in a blender. Add salt and pepper, to taste. Pour into soup bowls and garnish with cooked bacon and green onions. I have been making these for a couple of years, usually for a picnic or when dropping off meals. Using prepared pudding mix from the refrigerator section of the store and boxed crushed graham crackers, the dessert is almost made. In a bowl mix together the crushed crackers, melted butter, and sugar. Fill the jars about an inch high with the cracker mixture and pat down. Spread the pudding mixture on top, about another inch. Repeat, making another layer of each. Top with marshmallows and broil about 6 inches from heat source. Watch carefully as they go from brown to burnt in seconds. Serve immediately or cover with lids and store in the refrigerator. 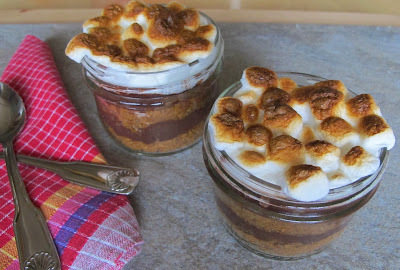 Jars minus the lids, can be heated in the microwave to warm for a few seconds, if made in advance. Note: Gluten free graham crackers are now available to make this a gluten free dessert.